We met with a record-breaking, platinum-selling music artist earlier today, and we’re very excited about the plans we’re drawing up for their forthcoming Social Commerce channel. Of course, this isn’t the first time we’ll have powered Social Commerce for a musical megastar – getting their legions of social media fans shopping and sharing in unprecedented numbers. Silver charm bracelets, boutique silk scarves, aromatherapeutic scented candles. Limited edition magazines, books and framed awards. Who knew Robbie Williams offered so many high-quality items of collectable memorabilia? Not his fans, according to the relatively low levels of traffic his online store received, and certainly not his social community – who would have run a mile if endless commercial messages had been forced upon them in a fallow period between album releases, when any real news about the star was, from their point of view, frustratingly hard to come by. It goes without saying that Robbie Williams has a hugely vocal and passionate fan-base, but it would require something special to stop them baying for news about upcoming activity and shift their attention to discussing merchandise. 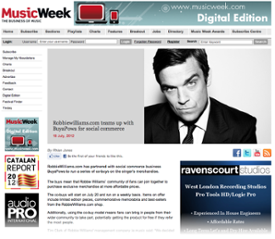 By implementing a dedicated Co-buying channel, which lived on the Robbie Williams Facebook Page, Robbie’s team were able to do just that – selling significant quantities of stock without overly commercialising his website, his email communications or his social media channels.Instead, Robbie’s most passionate superfans took ownership of the channel, discussing their dream Co-buys on his forum and via social media. Popular items graduated onto the channel’s integrated Request Chart, where fans would vote them up or down to determine the order of sale. Then, when each Co-buy went live, they fervently spread the word online, helping the promotions go viral. Instead of becoming a hard-sell, this new awareness of Robbie’s commercial line was entirely organic and grew from the bottom up. It was a new store by the fans, for the fans – meaning that Robbie’s team were able to share good news about the Co-buys launching and the prices dropping, without ever having to push stark commercial messages. Given the success to date, plans are afoot for the next generation of Robbie Williams co-buys… watch this space! Are your Facebook adverts getting it totally wrong?